The Prime Minister, Narendra Modi addressing the gathering at the inauguration of the Pakyong Airport, in Gangtok, Sikkim on September 24, 2018. The Union Minister for Commerce & Industry and Civil Aviation, Suresh Prabhakar Prabhu, the Chief Minister of Sikkim, Pawan Kumar Chamling, the Minister of State for Development of North Eastern Region (I/C), Prime Minister's Office, Personnel, Public Grievances & Pensions, Atomic Energy and Space, Dr. Jitendra Singh and the Minister of State for Electronics & Information Technology, S.S. Ahluwalia are also seen. The Prime Minister, Narendra Modi today inaugurated the Pakyong Airport in Sikkim. This is the first airport in the Himalayan State, and the 100th airport in the country. Addressing a large public gathering on the occasion, the Prime Minister described the day as a historic one for Sikkim, and an important one for India. He said that with Pakyong Airport, the country has hit a century of airports. The Prime Minister also mentioned the young cricketer from Sikkim, Nilesh Lamichanay, who recently became the first cricketer from the State to score a century in the Vijay Hazare Trophy. 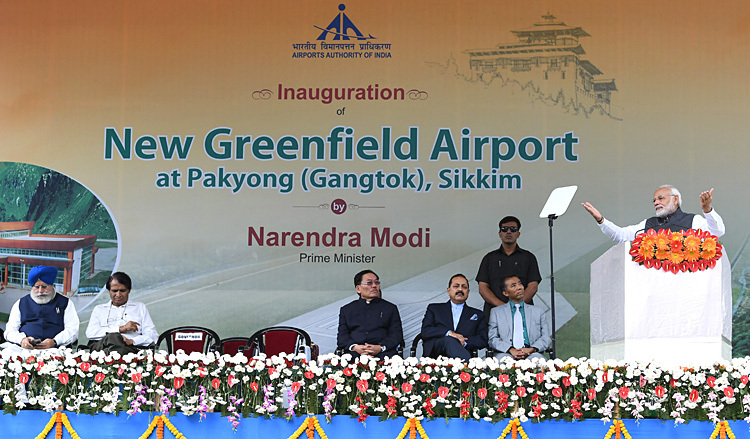 The Prime Minister said that Pakyong Airport would greatly ease connectivity to Sikkim. He said that in order to ensure that it is useful to the common man, this airport is part of the UDAN scheme. The Prime Minister said that emphasis is being given to enhance both infrastructural and emotional connectivity in the entire North Eastern region, at a rapid rate. He said he has personally visited the North Eastern States several times to review development work. Besides this, he added, Union Ministers also regularly visit the region. He said the results of this are visible on the ground. He mentioned enhanced air and rail connectivity, better roads, big bridges etc. The Prime Minister said that out of 100 airports in the country today, 35 have been operationalized in the last four years. The Prime Minister mentioned Sikkim's progress in organic farming. He mentioned that the Union Government has initiated the "Mission Organic Value Development for North Eastern Region."